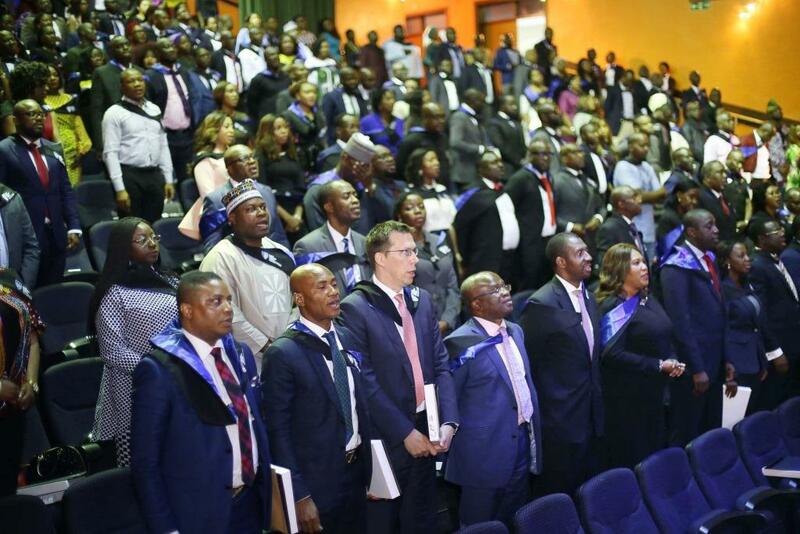 Over the weekend, the Lagos Business School (LBS), Pan Atlantic University, graduated 296 students from 13 Executive Programmes. The courses were Management Acceleration Programme (MAP 1 and MAP 2), Agri-Business Management Programme (AgMP 5 and AgMP 6), Senior Management Programme (SMP 61, SMP 62 and SMP 63), Owner Manager Programme (OMP 22, OMP 23 and OMP 24), Advanced Management Programme (AMP 29 and AMP 30) and the Chief Executive Programme (CEP 26). At the ceremony on Saturday, Professor Juan Elegido, Vice-Chancellor, Pan Atlantic University, Lagos, congratulated all the graduates and implored them to be good ambassadors of the institution by putting to use the knowledge they had acquired to better Nigeria and the African continent. Founder of LEAP Africa, Ndidi Nwuneli, who was also the guest speaker at the ceremony, spoke on building a new tribe of entrepreneurs and professionals that would transform the country positively. “I chose to speak on A New Tribe because we need a new generation of entrepreneurs and professionals that would transform our country Nigeria and contribute significantly to the African continent and the world,” she said. Chief Executive Officer of Rexton Industries Limited, Ify Ukachukwu, who graduated from OMP 22, said she felt gratified being a graduate of LBS. She said that the programme was mind-unlocking due to the quality of the faculty and the experience that the institution parades. “I had a mindset before coming to study here, but after the programme, I have been exposed to new perspectives and ways of doing things. It was a process of learning, unlearning and relearning that has opened a new vista for me. Indeed, it was quite transformational for me,” she said. Francis Raji, President of St. Paul Ranch and a graduate of AgMP 5, revealed that the programme had changed the operational style of his business. “The programme opened my horizon to re-invent my business. We have re-strategise our farming to make more profits and ensure that supply meets demand,” he said. He termed the LBS faculty as excellent. Toyin Sanni, Group CEO of United Capital Plc and President of Chief Executive Programme (CEP 26 class) said that the Lagos Business School remains a reliable resource centre for private individuals, entrepreneurs, professionals and corporate bodies who want to acquire advanced skills in their areas of endeavour. “The level of insight and exposure acquired during this programme is commendable and we are proud to say that LBS is a front liner in professional development in Nigeria and Sub-Saharan Africa,” she said. She thanked the LBS faculty for their readiness to add value that would impact positively on the value chain. Bola Adesola, President of LBS Alumni Association and Managing Director Standard Chartered Bank inducted the graduates into the Alumni Association and welcomed them “welcome to our tribe of privileged, honoured and distinguished LBS Alumni” she said. She also charged them to be ambassadors of LBS and to uphold her values and objectives. Adesola concluded by encouraging the graduates to be champions of the good work that LBS was doing. Dr Enase Okonedo, Dean, LBS, congratulated the graduates and new alumni of the institution and appreciated them for their commitment, which had continually enabled the institution to equip itself to be able to contribute its quota of providing quality education and professional development to individuals and corporate bodies. She also applauded the graduates for their zeal to study at the LBS despite the economic recession many professionals use as reason not to invest in their self-development. “Despite the economic challenges that could deter many private individuals and Organizations from investing in courses like these, you have demonstrated your zeal to equip yourselves professionally nonetheless. I implore you to use this zeal to contribute to the global value-chain,” she counselled. The excited graduates said they were going out positively influenced and are ready to contribute their quota in making the society a better place.